For some time my lady and I have been considering doing another 4WD trip into the high country around the Dartmouth Dam. A couple of years ago – pre SOTA – we did a memorable trip through the trails on the western side of the lake including a side trip down the Eight Mile Track and concluding with no less than fourteen crossings of Lightning Creek on the way out to rejoin the Omeo Highway. We enjoyed that trip so much that another visit to the area was high on our To Do list, and a scan of the SOTA mapping project site soon identified several Summits of interest. These were Mt Benambra, Mt Cravensville and the Gibb Range, all three of which we calculated could be visited in a single expedition. Mt Benambra is accessed most easily via the signposted trail off the access road to the Dartmouth Dam. It’s not too steep though it is a little rocky, but there are none of the large “speed humps” that we so often encounter on trails like this one. This trail should be accessible by AWD vehicles, at least in dry weather, though I wouldn’t be keen to try it in a 2WD. I wouldn’t recommend trying it in wet weather in any kind of vehicle, except perhaps something with tracks (a tank, maybe). 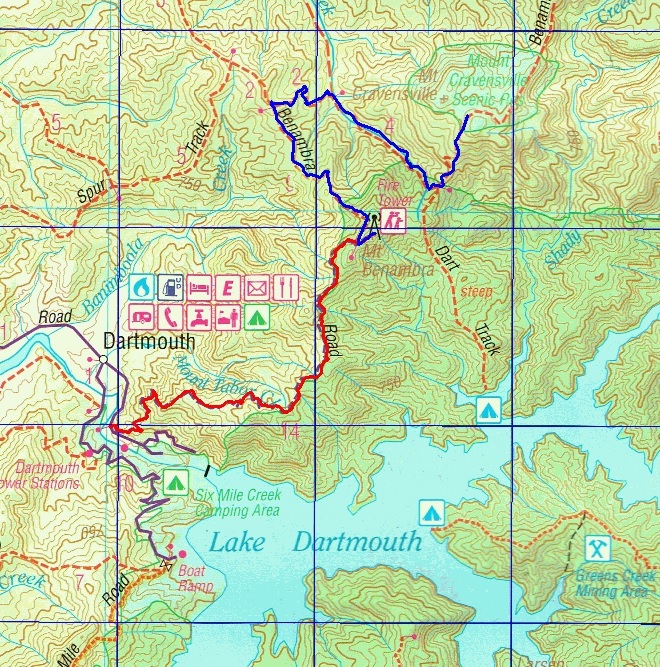 It’s about 15km from the Dartmouth Dam road to the summit and unless you really don’t care about your vehicle you’re going to be doing no more than 15-20km/hr on this trail, so allow an hour to get up there. We arrived a little early for our alerted activation and took the time to stroll up onto the viewing platform. Unusually, the platform is within the tower itself and the fire watcher’s cabin is mounted directly above it, so from the viewing platform you get pretty much the same outlook as the fire watcher does. While we were up there pointing and ooh-ing and ahh-ing the fire watcher arrived for his shift, and we spent a few minutes chatting with him while he pointed out the landmarks all around. He said that on a clear day you can see Mt Kosciuszko from up there, but there was a fine layer of smoke haze that prevented us from seeing that far. Suddenly realising that I was now late for my scheduled activation time, I quickly retreated from the tower and found a suitable tree to sling the dipole from. With the set-up completed in about ten minutes – we’re getting quite good at it now – I switched on the FT817 and on 7MHz I quickly worked VK2QR/p, VK3PF/p, VK3CAT/p, VK1MA, VK3MRG/p, VK5NIG, VK3FPSR, VK3FQSO, VK2YK, VK3BHR, VK2FGJW/p, VK3ZPF/p, VK5BJE/7, VK2IO and VK3SD/p. 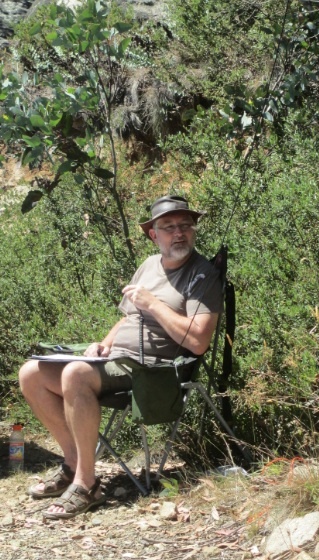 I was delighted to make several S2S contacts as well as a couple of QRP stations, once again demonstrating what can be done with low power and simple antennas when conditions are right. I had brought the Barrett 940 along on this trip, intending to use it on 14MHz and above as an experiment to see whether its higher transmit power would be worth its additional weight. Unfortunately, though, the march flies had found us and were dive-bombing us intent on making us their lunch, so when 7MHz went quiet we quickly packed up and beat a hasty retreat. Next on the itinerary was Mt Cravensville, VK3/VE-058, which we calculated was about 13km along the trail though much less than that as the RF flies. We had plenty of time and so decided to stop along the way, when we found a suitable spot to have lunch. 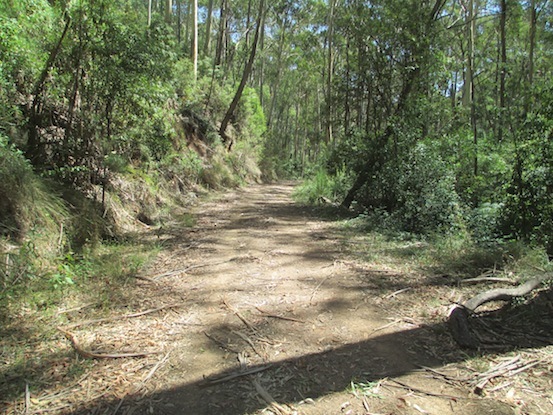 This trail is a continuation of the Benambra Spur track and is similarly rocky, once again devoid of “speed humps” and probably accessible in an AWD vehicle. It is a little steep in places but probably nothing that an AWD couldn’t cope with. We found a nice spot to have lunch down in a valley with a little creek trickling beside the road. We enjoyed a leisurely lunch untroubled by march flies or any other pesky critters and then resumed the drive to Mt Cravensville, with the GPS counting down the distance to the nearest point on the trail to the summit. We got within 300 metres before the distance began to increase again, so we back-tracked, parked the truck and hopped out for a look around. The bush up there isn’t too dense and it’s quite easy to stroll through it to the actual summit, though the ground is quite uneven and there are the usual bush hazards to look out for on the way. We soon found a suitable spot and once again threw a line over a handy tree branch and hauled up the dipole. The 7MHz band was still lively with several SOTA activators out and about, so I parked myself in my portable shack and joined the fray. In about 25 minutes I had logged contacts with VK2DDS/p, VK3YE/p, VK3APC/p, VK2JI/p, VK3HRA, VK1MA, VK3FPSR, VK2YK, VK2IO, VK1DI, VK3DET, VK2DAG and VK3ZPF/p. I was particularly pleased to make contact with Peter, VK3YE, who was walking around using his portable magnetic loop antenna with his FT817. We chatted for several minutes and I was very impressed with his signal, which remained a steady S3 throughout. Amazing. We had considered going on to activate a third Summit, Gibb Range, on this trip but having concluded operations at Mt Cravensville we decided we’d had enough radio work for one day. We made our way down from the Summit and retraced the Benambra Spur trail to its intersection with the Tallangatta Creek trail, which we then followed to bring us back to the sealed road. We were almost clear of the forest when we encountered a tree down across the trail – the only one of this expedition – but it wasn’t too big and we soon dragged it clear without having to resort to the saw. The last 300m of the Tallangatta Creek track crosses farmland and there are a couple of gates that we had to negotiate. Anyone wanting to take this route in to Mt Cravensville might like to note that it isn’t that obvious as you approach it along Tallangatta Creek Road, and so setting a waypoint on your GPS might be a good idea. Although this trail has all the indications of being a private farm driveway it is in fact a public right of way, but you still need to be wary of stock wandering around and make sure you leave the gates as you find them.